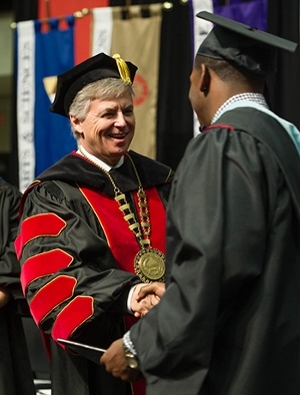 Southern Illinois University Edwardsville Chancellor Randy Pembrook, PhD, oversaw the 2017 Fall Commencement exercises Saturday, Dec. 16 in morning and afternoon ceremonies for the 1,257 eligible graduates in the Vadalabene Center on campus. Ceremony Videos - 9 a.m. | 1 p.m.
McKenzie Ferguson, PharmD, associate professor in the School of Pharmacy and SIUE’s 2017 Teaching Excellence Award winner addressed the morning ceremony, which featured the Graduate School, and the Schools of Business, Nursing, and Education, Health and Human Behavior. “Throughout my undergraduate experience I was introduced to many students, faculty, administrators, and staff members who continually encouraged me to keep setting goals and moving forward,” Gilbert said. “That positivity, encouragement and the supportive environment SIUE offered - made me never want to leave. Special guest speaker Col. Marc Packler, commander, 375th Communications Group, Scott Air Force Base (SAFB), addressed the afternoon exercise, which featured the Graduate School, College of Arts and Sciences, and School of Engineering. Packler was appearing in honor of SAFB’s 100th anniversary and delivered a motivational speech on leadership. Jack Glassman, PhD, associate professor and chair of the Department of Physics in College of Arts and Sciences, is the 2017 Great Teacher Award recipient as selected by the SIUE Alumni Association. He provided the commencement address during the afternoon ceremony and focused upon one of history’s most famous teachers, the Greek philosopher Socrates. Glassman thinks every teacher has looked to Socrates as a source of inspiration at some point. Alex Myers was the afternoon student speaker. He earned a bachelor’s in mechanical engineering from the School of Engineering. Myers spoke of attaining grit as one of his positive collegiate experiences.